Can Exposure to Chickenpox During Pregnancy Cause a Miscarriage? Chickenpox, aka varicella, was once a common childhood infection. Most children nowadays receive a vaccination against chickenpox but the virus is still circulating in the population. For most people, chickenpox is no reason to panic. Most children who contract the virus do not have serious complications; adults can be somewhat more uncomfortable but usually recover from the illness without severe problems. The vast majority of chickenpox infections occur in people aged 1 to 14 and only 2% of recorded infections occur in individuals over 20 years of age. Among the rare pregnant women who are not already immune, exposure to varicella during pregnancy can cause complications. About 10% to 20% of infected women can develop a condition called varicella pneumonia. Women who are immune are generally not at risk for complications, and about 85% to 95% of women are immune. Miscarriage and stillbirth can also occur after a mother contracts chickenpox during pregnancy, but based on the limited available data, non-immune moms exposed to chickenpox in the first trimester do not appear to have increased rates of miscarriage compared to the general population. The primary concern in contracting varicella during pregnancy is the risk of congenital birth defects — and even in this respect, there's no cause to panic quite yet even if you have been exposed. 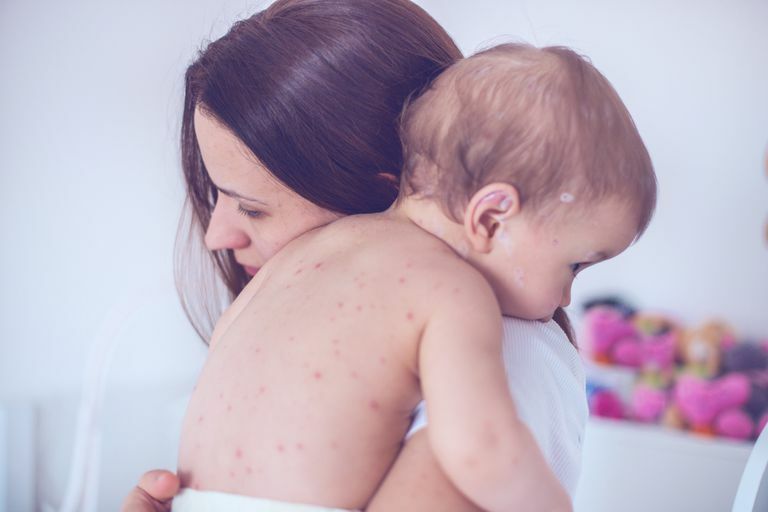 Although birth defects from chickenpox exposure can be severe (congenital varicella syndrome), the risk of a baby having birth defects due to chickenpox exposure in the first half of pregnancy is between 0.4% to 2%. Exposure in the second half of pregnancy would not be likely to result in birth defects. Complications for the baby are unlikely if chickenpox exposure occurs between the 20th to 36th week of pregnancy, although the mother can face health risks. The baby faces the highest risk if exposure to chickenpox occurs during the last month of pregnancy. In these cases, the baby can develop chickenpox in the womb. This would be neonatal rather than congenital varicella — neonatal varicella does not involve birth defects but instead a systemic disseminated infection with very high mortality rates. There is a substantial risk of neonatal death if the baby is born with chickenpox. Women concerned about exposure to chickenpox during pregnancy should see a doctor about the matter. A doctor can order a blood test to determine whether or not the mother is already immune to chickenpox. And if not, the doctor can decide on a course of action. Doctors may wish to give varicella-zoster immune globulin (VZIG) to women have been exposed and who are not immune, or they may prescribe a medication such as Acyclovir. Balducci, J, J.F. Rodis, Rosengren, "Pregnancy outcome following first-trimester varicella infection." Obstetrics & Gynecology 1992 Jan;79(1):5-6). Centers for Disease Control and Prevention, "Varicella Vaccine - Q&As about Pregnancy." Vaccines & Immunizations. 12 June 2007. Harger, J.H., J.M. Ernest, G.R. Thurnau, et al. "Frequency of congenital varicella syndrome in a prospective cohort of 347 pregnant women." Obstetrics & Gynecology 2002 Aug;100(2):260-5. March of Dimes, "Chickenpox in Pregnancy." Apr 2007. Pastuszak, Anne L., Maurice Levy, Betsy Schick, Carol Zuber, Marcia Feldkamp, Johnathan Gladstone, Fanny Bar-Levy, Elaine Jackson, Alan Donnenfeld, Wendy Meschino, and Gideon Koren, "Outcome after Maternal Varicella Infection in the First 20 Weeks of Pregnancy." New England Journal of Medicine Mar 1994. Royal College of Obstetricians and Gynaecologists, "Chickenpox in Pregnancy: What You Need to Know." 2003.